Just imagine the sound of a water feature in your garden and you’re almost there. A small garden fountain is simple to build and you can make one in a few hours. And, no pit to dig. You can install the fountain pump inside the container. One thing though, you’ll need to start building your water feature a day in advance to let the silicon caulk dry before adding water. Here’s what you’ll need and how I built mine. First, I purchased a kiln-fired glazed plant container, a fountain pump, and a tube of silicon caulk. You need a glazed plant container so your garden water feature won’t leak. Next, I cut a hole in the bottom of the container big enough for the plug to fit through. I used a diamond hole saw drill for granite, glass or tile which is a standard drill bit that you can use with a battery-powered hand drill. Take your time cutting the hole so the container doesn’t crack. Use a bottle of water to cool the drill bit as you drill; you don’t need much water at all. After cutting the hole, I ran the pump’s electrical cord through the hole and filled the space around the cord with clear silicon caulk. I let the caulk dry overnight. The next day I filled the container with rocks and water and plugged it in – almost done. Next, I cut a piece of 1/2-inch copper pipe and connected it to a rubber hose that came with the pump; it will also fit over the pump’s plastic outlet-tube (if it comes straight up from the pump). It didn’t take long at all to make the water feature and it is a nice addition to our backyard landscaping. We received several positive comments about it from our friends. It was truly simple to make. Oh, the dogs in the photos? That’s Lily (the chocolate) and this is Lily’s Pad. 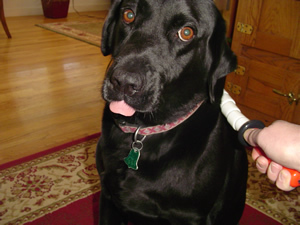 The yellow lab is Madison – she is special (according to Madison LOL). No doubt Lily knew I was making the water fountain for her all along. She waited patiently on the deck while I was building it. As soon as I plugged it in she started drinking from the fountain. Madison waited until Lilly tested it out first. 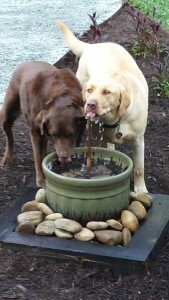 Our other lab, Echo (black lab, now in dogie heaven), also loved drinking water from an outdoor fountain. The photo is Echo getting a massage with the Pet Stick. After four months, the water feature is still working great. We rarely turn it off. I do clear the pump intake filter whenever I fill up the fountain. All I do is spray the hose at the base of the pump – works great. I haven’t needed to take the pump out of the container since it was installed. The dogs love it and drink more water from it than their water bowls in the house! How do you clean the water? The bowl is stationery, right? So how do you dump the water, when it is dirty? Ilonka, You can lift the container/bowl and empty it, if necessary. The container is sitting on the ground. FYI – I haven’t had to “dump” the water out at all and I’ve been using the fountain for about a year now. The water is still clear; however, when I top off the water I put the hose on full blast. I aim the hose at the pump inlet and rocks which are on the bottom of the inside of the container. The rocks inside the container surround/hide the pump. The debris on the bottom of the container floats to the top as the water mixes. I continue filling the container until it overflows; most of the debris floats out of the container or I’ll scoop it out (leaves, etc.). I am somewhat surprised that the water is so clear just by using the hose. If necessary, you can empty the water by running the pump with the outlet tube pointed outside of the container. Then, remove the rocks and clean out the container manually. I haven’t needed to do this so far to clean the water. I did empty the water for the winter so the container didn’t freeze and crack. I covered the container after it was empty so it didn’t fill up with rain water. I hope this helps. Let me know if you have any more questions. Thanks. I LOVE this fountain idea and I can’t wait to make it! I was wondering how often you have to add water to it after the dogs have had their fill or if you let them drink it down till it’s almost empty before refilling it? The dogs love it. They use it all of the time; more than their water bowl in the house. We fill it up 1-2x per week unless it rains. We have a hose relatively close by the area, which we use to water container plants on the deck. I also run the hose at full force until the fountain bowl over-flows. This helps to mix the water and it also helps to keep the pump clean. I point the hose at the pump intake area under the rocks. The fountain really worked out well. The water is almost always clean and the pump hasn’t had any issues at all (over a year and a half old now). Fantastic idea which I’ll promptly use. My partner in crime Max will love this! I may make it a bigger pot as we plan to adopt another. Your furry friends are cute. Dogs are the best. The pump cord is slightly buried in the ground so the dogs don’t get to it. It is plugged into an outdoor outlet I installed near our patio (a few feet from the water fountain). You can also buy an outdoor outlet attached to an extension cord that spikes into the ground (bury the cord under mulch or a little dirt). I hope this helps. Hello, maybe I missed a step in reading. A pot is usually deep but the pic shows the dog drinking from a shallower bowl. Is it the pot base used at a bowl? The pot is deep. It has rocks inside that cover the submerged fountain pump. What size pump would you recommend? Surprisingly, after two years we haven’t had a problem with algae so far. The moving water seems to keep it clean. Also, we rinse the water out with the hose on full blast when we refill it or top it off. You can empty the container by pointing the spout outside of the container and the pump will empty it for you. Or, you can scoop out the water with a cup or something. We have rocks covering the pump inside the container; the spout is the copper pipe/tube that is attached to a rubber hose, which in turn is attached to the pump. The rocks inside the container are leaning on the copper tube to keep it upright. The rubber hose attached to the pump is long enough to reach outside of the container to empty the water, if you want to do it that way. I’ll take a few more pictures of the setup and add them to this page soon. Our labs really love the fountain especially after a round of Frisbee! 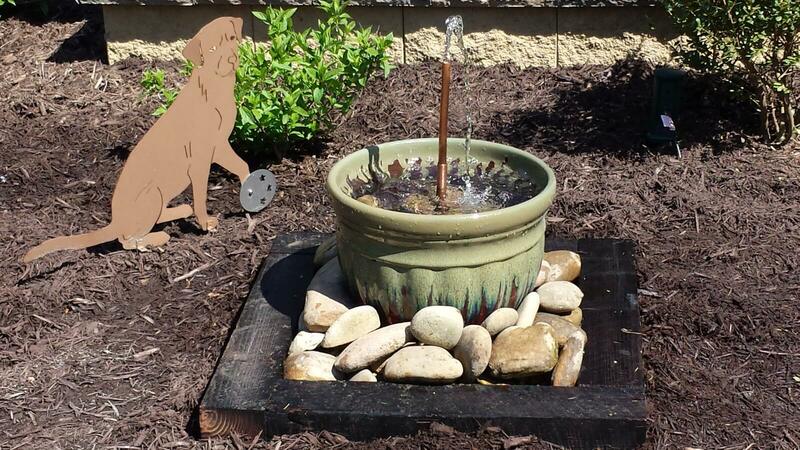 I love this for the dogs to get water in the summer. I bought the container and copper last year. My son the procrastinater wants the perfect pump. Will show him this with plump hilited. Hi. 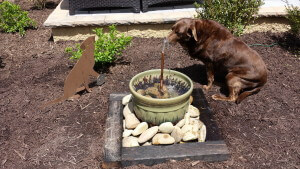 We built our dog fountain 2 weeks ago and it has algae growing. Any suggestions? Not sure what to tell you. We’ve had ours for a few years now and we have very little algae. Is it pumping enough water to keep things moving? We keep our pump on 24/7; do you by any chance? It looks like I’m a little late to this party, but I just saw the post today. I am interested in doing this but I have German Shepherds who drink a lot of water. How would you suggest a constant water supply be fed into the pot so we wouldn’t have to replenish it so many times per day. I’ve been trying to find automatic waterers without any luck and would love to be able to make this work. It is such a great idea! May I suggest you try using the device that regulates the water in a toilet bowl tank. It has an automatic shutoff based on a float. That would more than likely work for you. I hope this helps.